Archaeology Live! Summer 2014. Week 7. Finds work under the bell tower. We’re getting into quite the routine down on North Street. Every Monday morning, we head out and greet the latest additions to the team and show off our rather flashy medieval site hut. After a quick induction, we head out into the trench and show everyone what they’ll be working on. 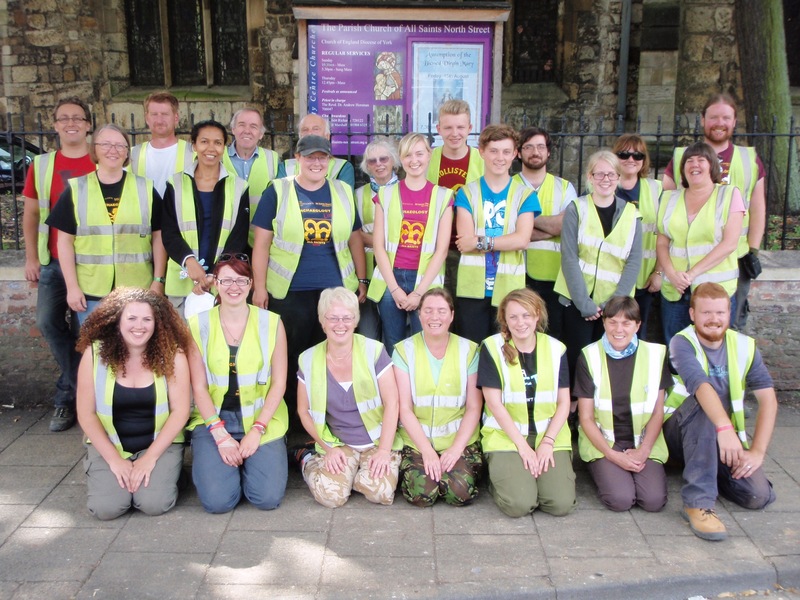 A good place to begin, for both new trainees and Archaeology Live! veterans alike, is to break out the trowels and have a quick clean. Ellen & Biagio, trowellers extraordinaire. 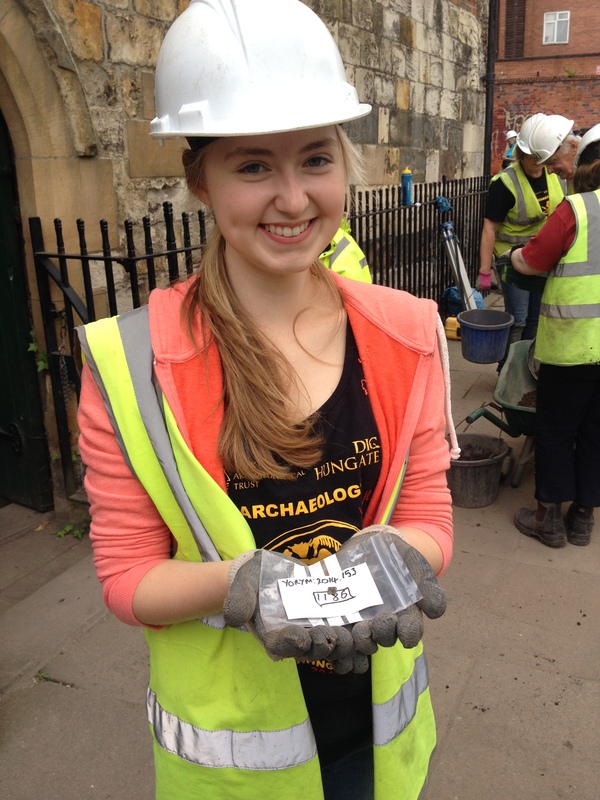 This allows everyone the chance to ‘get their eye in’ and to experience the volume of finds that pour out of rich, urban deposits. 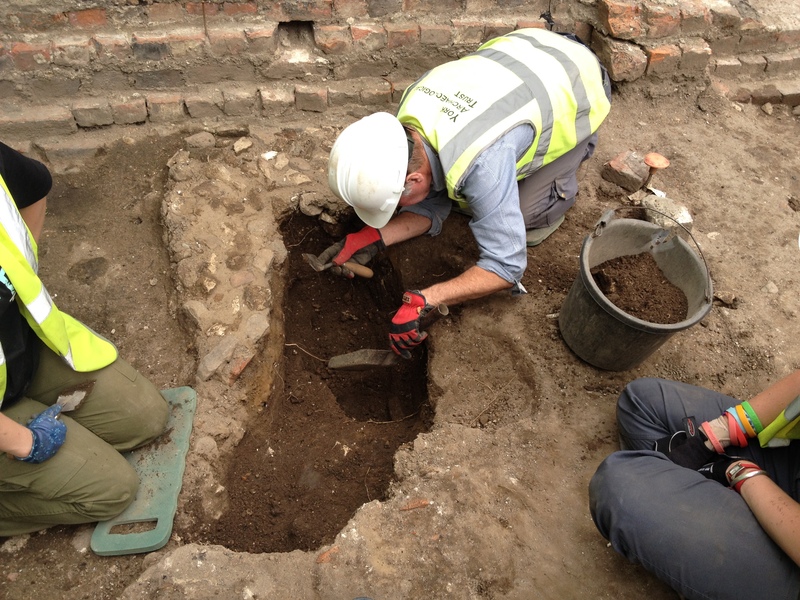 Once people are happy with basic trowelling and can resist the temptation to pull out finds from unrecorded contexts, they can tackle just about anything! Team This End began their week this very way. New additions Daniel, Ben, Linda, Jeanette and Kirsten worked together to freshen up the surface and re-expose edges that had become a little muddled after the weekend’s rain. With the site looking clean and tidy, the team began to work on a number of possible 19th century graves that were identified last week. Historic references date these to between 1823 and the late 1850s, hopefully the finds we recover may allow us to tighten this dating sequence. 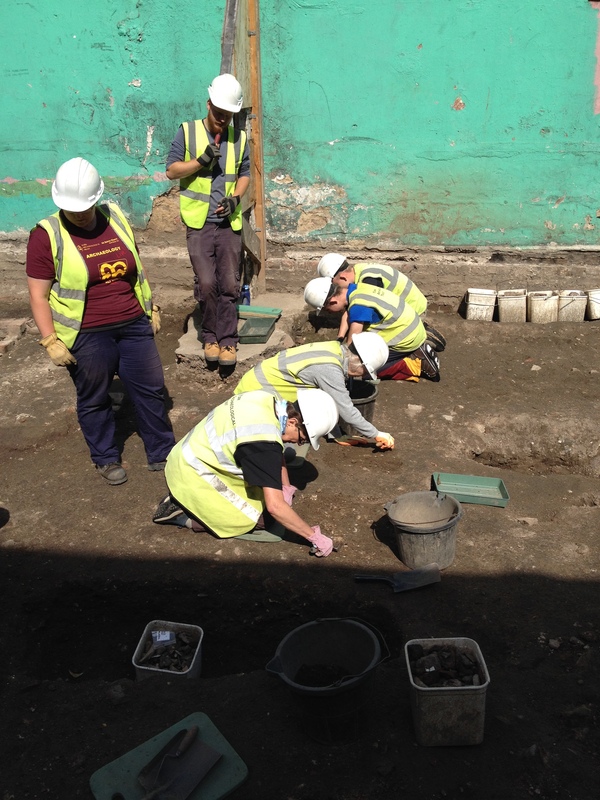 No articulated burials are scheduled to be removed at present, but we will be recording and then re-covering any inhumations that we encounter. Ben and Daniel picked up the excavation of a possible grave that was started last week. Ben and Daniel working on a 19th century inhumation. The edges proved tough to follow at first, but with a spot of guidance from Toby, the pair were able to spot and follow the extent of the grave cut, in turn revealing earlier deposits in section. 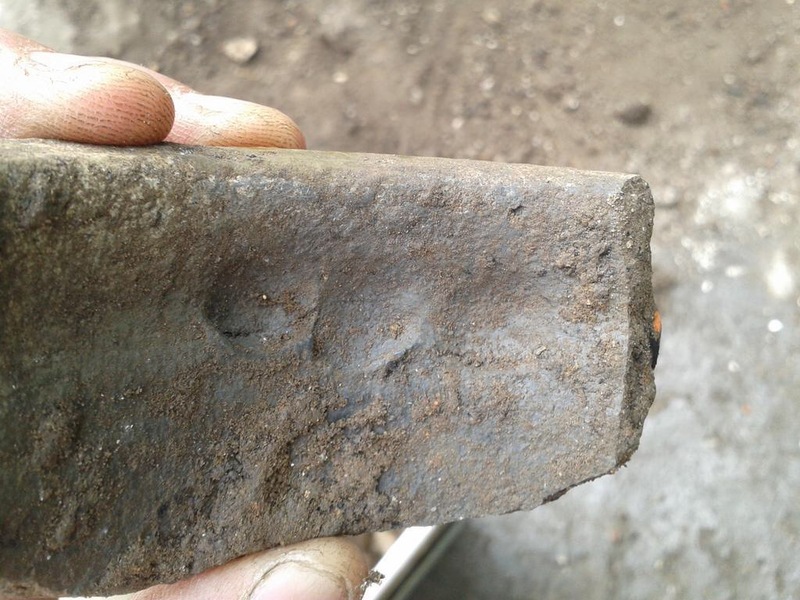 Like other grave cuts under investigation, this feature proved to be rather deep, it also contained some great finds! Daniel was particularly chuffed with a copper alloy coin. Difficult to date before it is cleaned, it appears to have been deliberately bent. Daniel and his first ever coin. 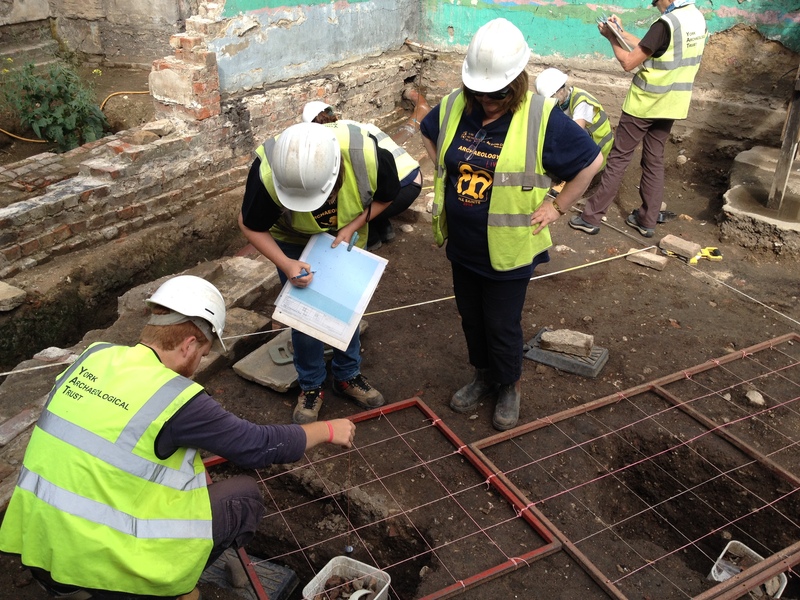 This year marked a big year for Archaeology Live! regular Kirsten. 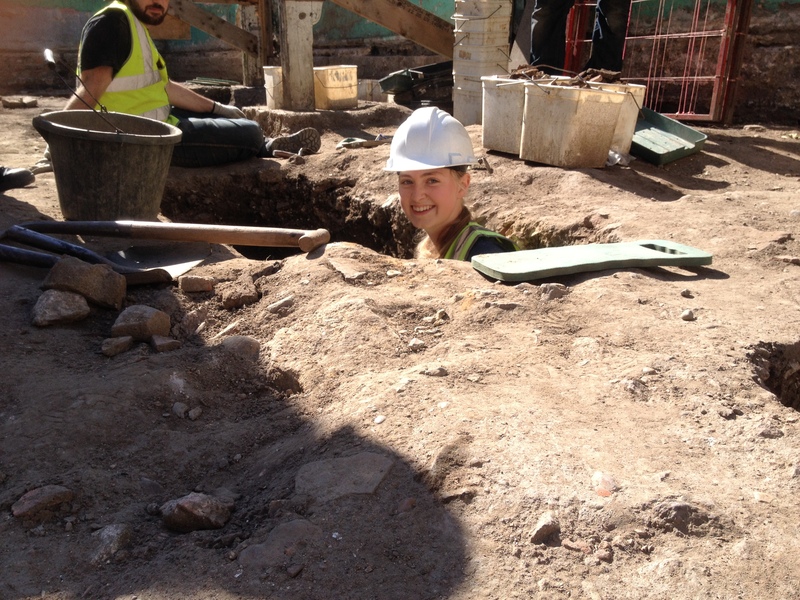 Travelling from Denmark, Kirsten is currently enjoying her tenth year digging with us! 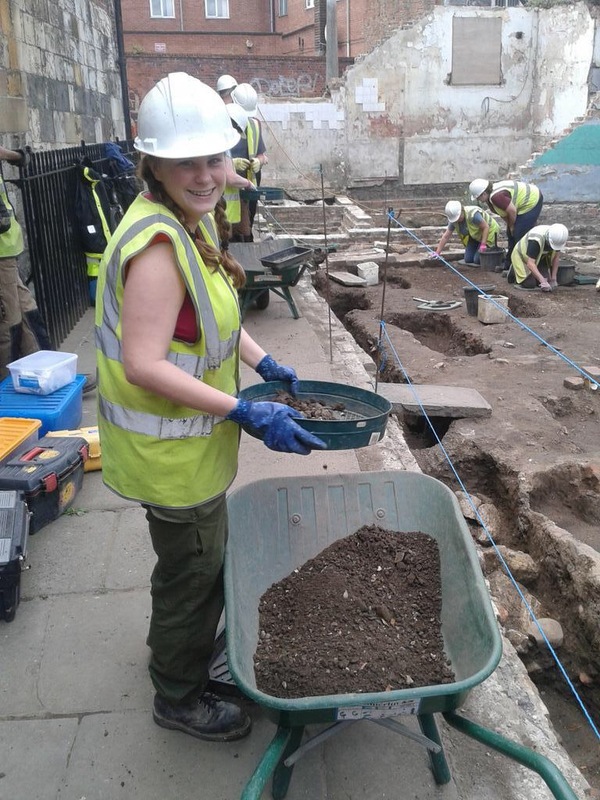 It seemed only right to pair her with Kaye, who’s come all the way from New Zealand for the dig and was part of the team for our inaugural season of Archaeology Live! way back in 2001. Kirsten and Kaye hard at work. The international duo got to work on another possible burial, started by Kaye in the previous week. It quickly became apparent that this was another very deep grave cut, with some interesting finds in the backfill. Decorated stoneware from Kirsten’s feature. As the feature grew deeper, a looser rectangular area was exposed in the centre of the deposit. This most likely represents material that collapsed down into the cut at the point when the timber coffin decayed and gave way. Kirsten and Kaye also began to notice the presence of coffin nails and fragments of degraded wood around the edge of this looser soil. At present, work on this feature has been suspended until the surrounding area is reduced to a lower level. This will allow for better treatment of the feature and safer working conditions. Kirsten and Kaye’s grave cut. Note earlier stratigraphy in section. 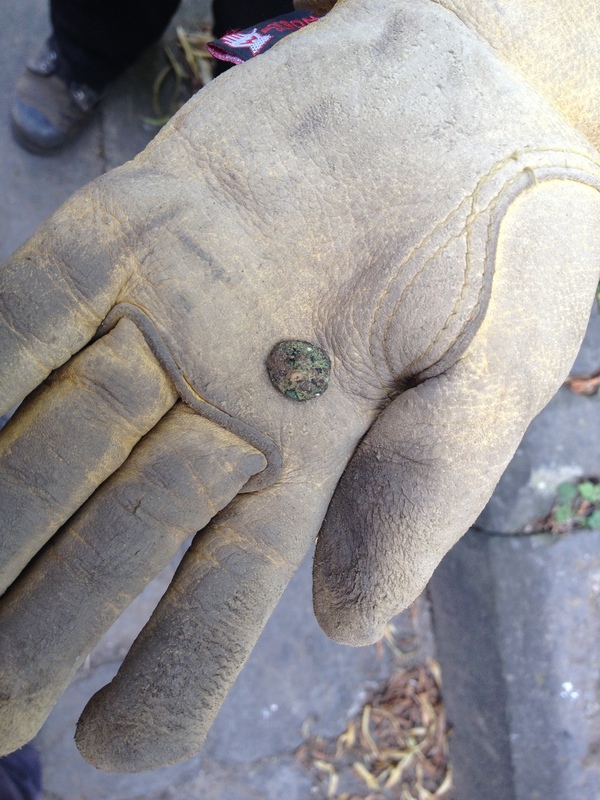 The frustration of stepping away from of the feature was happily offset when Kirsten spotted a small copper alloy coin. 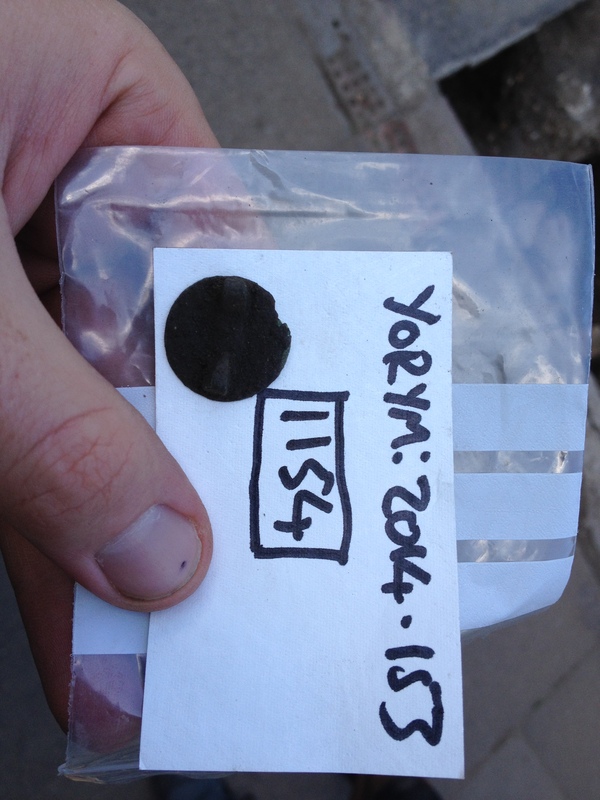 It looks to be Roman in date was a nice way to mark Kirsten’s decade of digging! 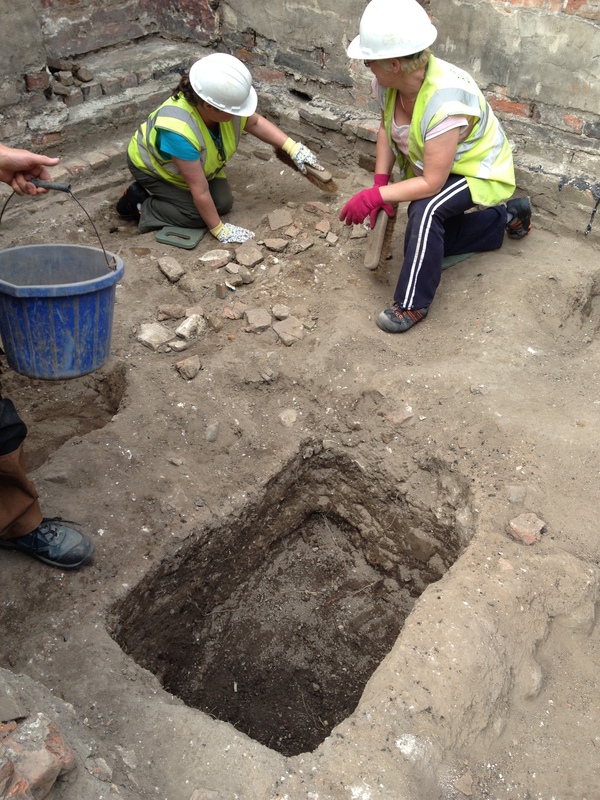 Elsewhere in Toby’s area, returnees Jeanette and Linda were involved in similar work. Taking one grave cut down to around 500mm in depth, the pair also temporarily abandoned their feature with a view to picking it up later. They then turned their attention to a wider rectangular feature slightly to the north. After completing a plan drawing, context card and photography for the context, they began to excavate the backfill. This will be an interesting feature to follow as its width is unusual. It could be a large refuse pit, or alternatively, it could be a double grave. Excavation will continue next week. As several of the grave cuts were being put on ice, the This End team made thorough records of the cuts as they were currently exposed. This resulted in one of the years busier planning sessions! 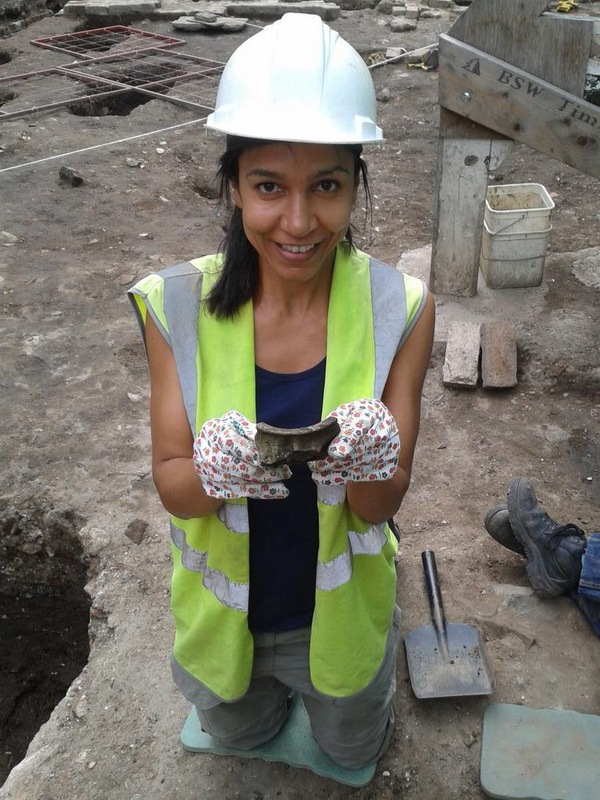 Joining us for a two day taster, Annie picked up work on an enigmatic feature close to the trench’s southern edge. Annie working on her rectangular feature. 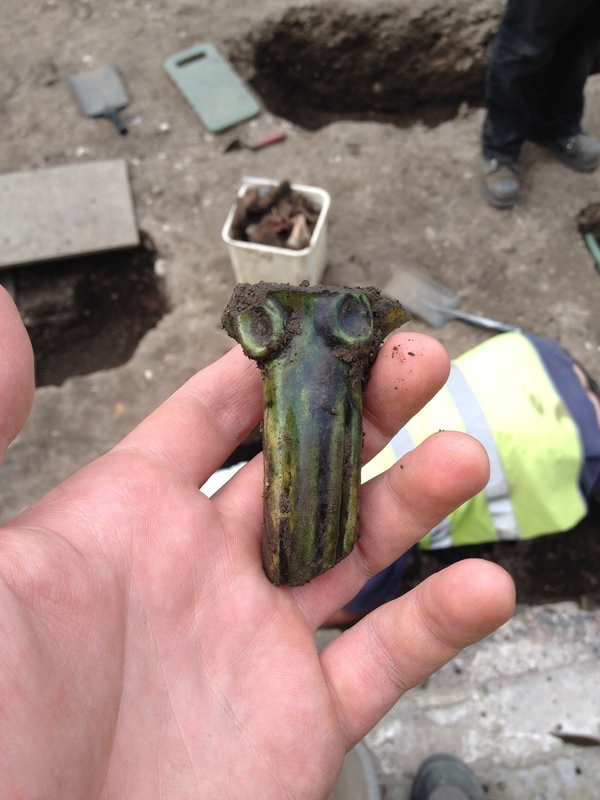 Green elephant or medieval jug? …and a post-medieval copper alloy lace tag. Annie showing off her lace tag. As the feature deepened, juvenile human remains were reached at the base. However, excessive depth again meant that this feature will have to be left alone for now. Investigation will continue later in the season. 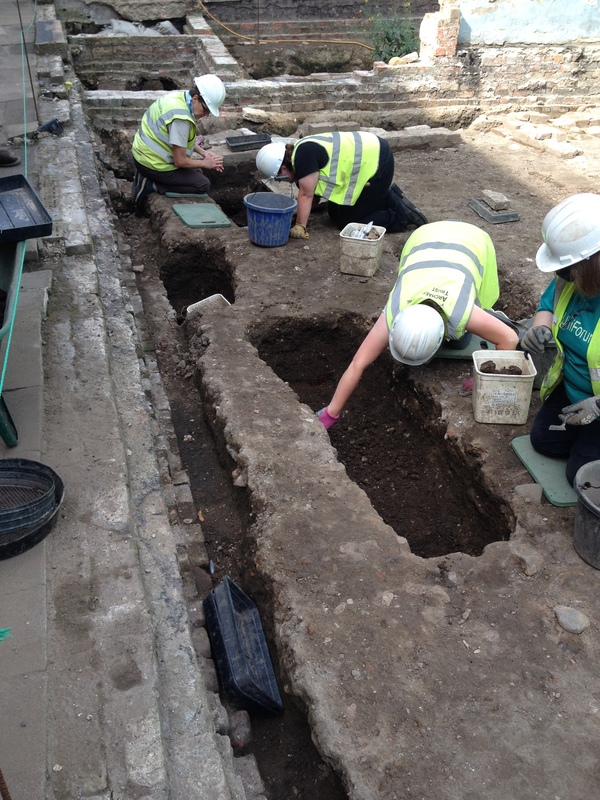 Work also continued on the post-medieval rectory, with two events of robbing being identified over ‘missing’ sections of wall. Recording robber cuts over the rectory. These features were recorded and will be investigated next week. This should hopefully free up the deposits that date to the building’s use, as opposed to its demolition. All being well, we will now be able to learn more about how the buildings were used and what role these surviving structures played. The trench increasingly resembling a moonscape. In Gary’s area, Ellen and Biagio began their week by cleaning up and recording the grave cut they had worked on last week, which will also be temporarily abandoned. Ellen and Biagio’s cut is proving to be very deep. Finds were again promising, as Ellen discovered a lovely copper alloy stud alongside a mass of pottery, animal bone and CBM (brick and tile). Work on this feature will continue next week. Ellen shows off her latest find. Sue and Gill took on the unenviable task of tackling ‘contrary corner’. They continued work on a deep pit that has been in play for several weeks now. Reaching a maximum safe depth, this feature was also put aside for now. 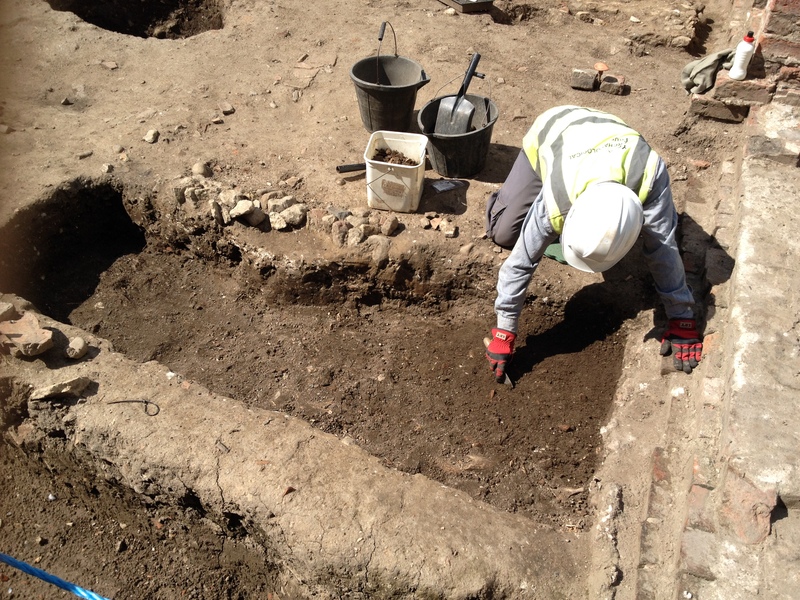 A dump of rubbly material, possibly a rough yard surface, was then recorded and excavated. 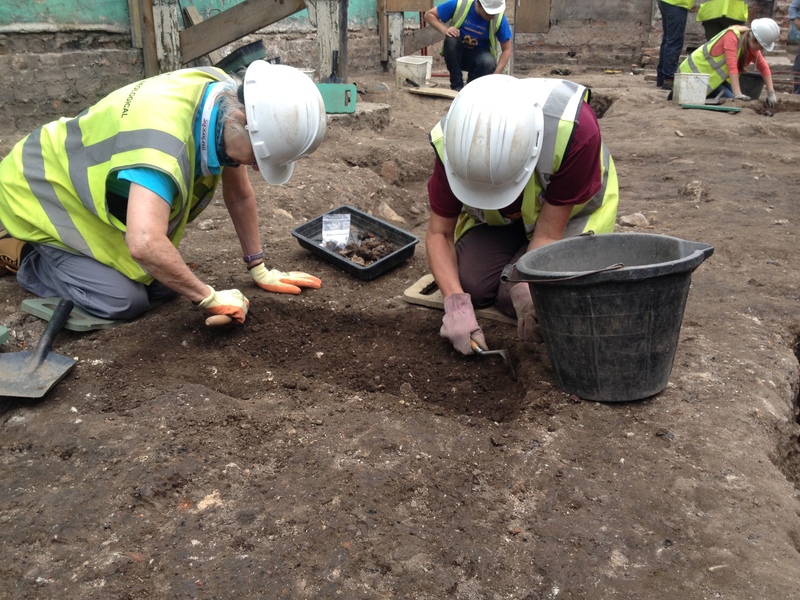 Sue and Gill cleaning up a layer of rubble. 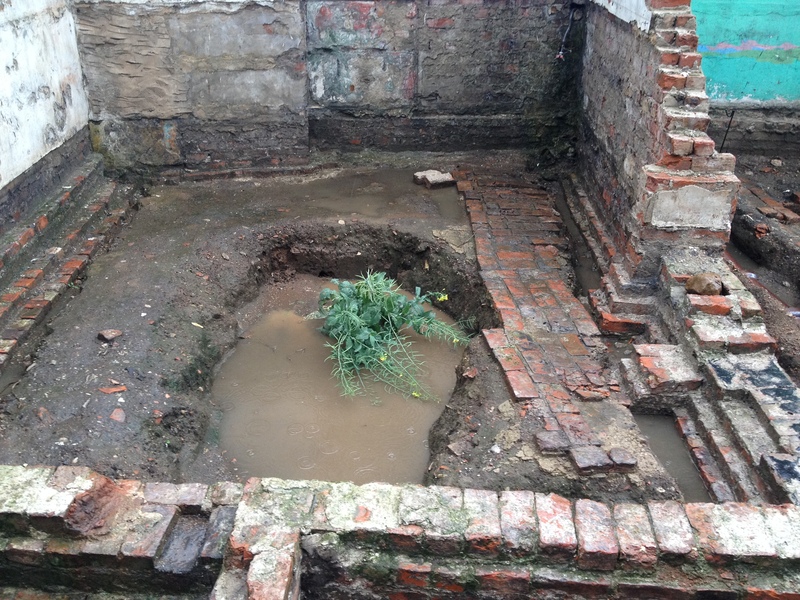 The context contained early 19th century material alongside some high status medieval and post-medieval pottery. 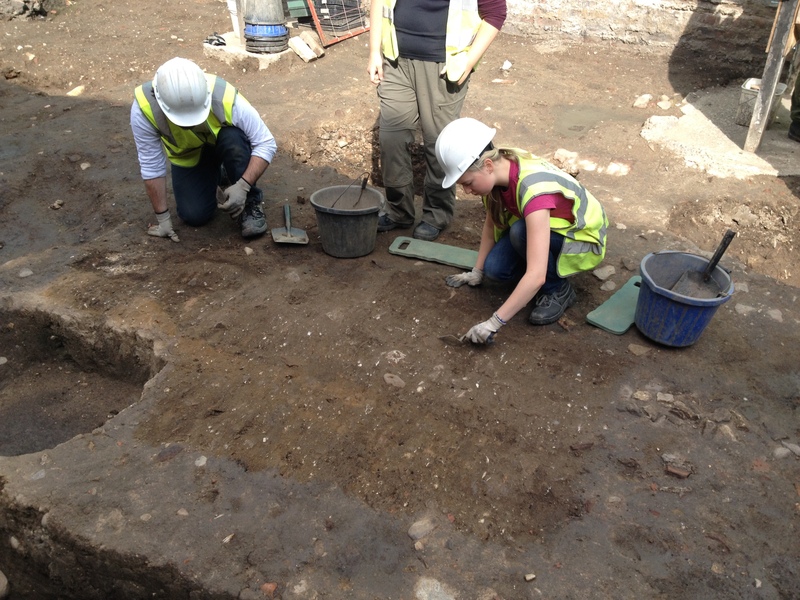 Beneath the rubble, a small layer of burning was exposed, part of a complex sequence of varied activity within the old yard space. Sue and a fragment of fancy medieval pottery. 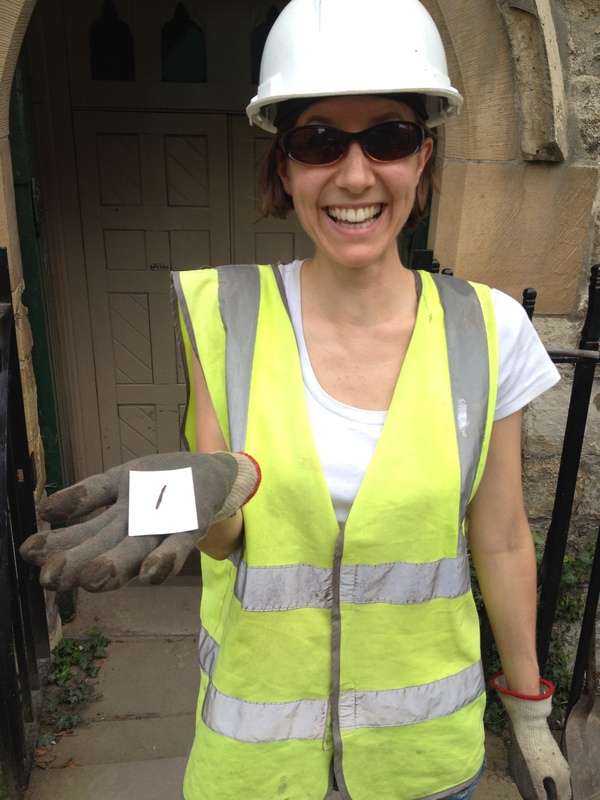 The value of sieving was once again proved as Gill picked up a copper alloy brooch from her deposit! 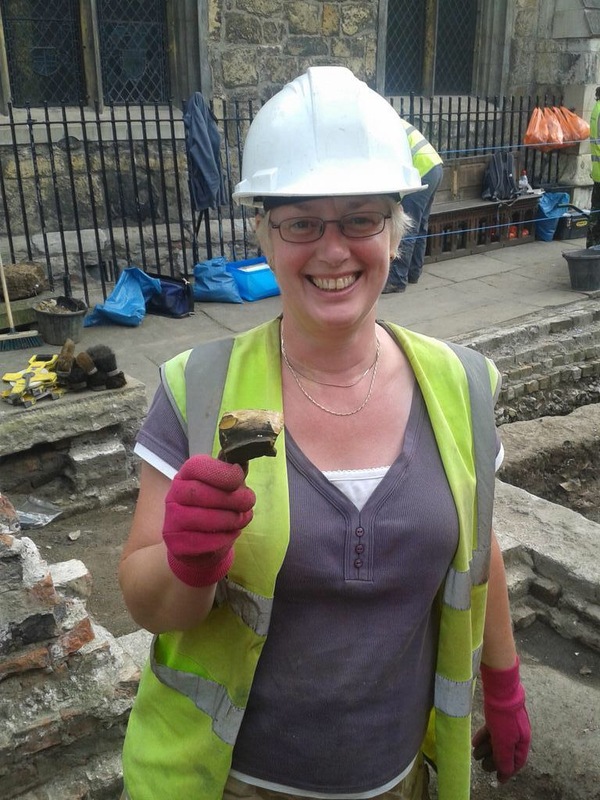 She also unearthed an interestingly scorched fragment of a post-medieval vessel. Alan working on the ‘horn pit’. No less than fifteen tubs of bone and horn core have now been recovered from this feature, all of which has been diligently sieved. Rosie cheerfully sieving the backfill of the horn pit. As the pit appears to be showing no signs of stopping, it has also been left aside for now. 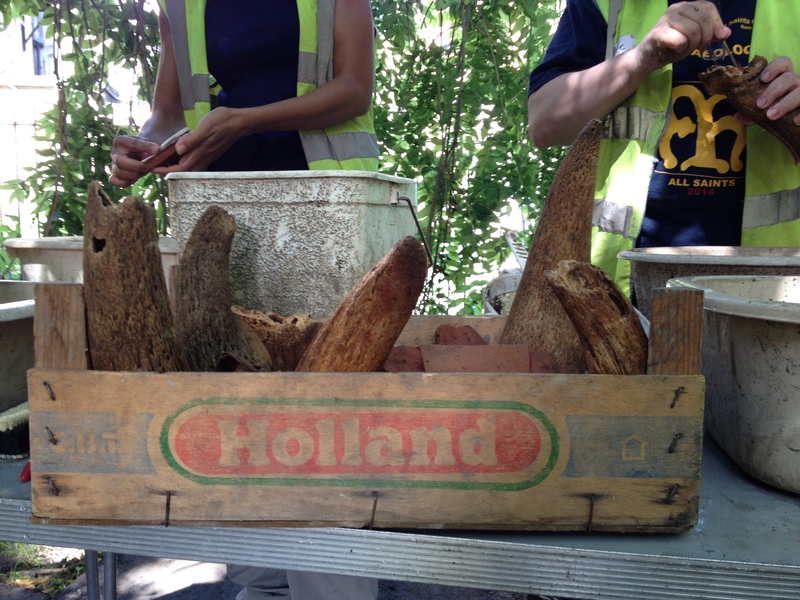 It can be finished later in the season and the finds team will need a good deal of time to process all of the bone! 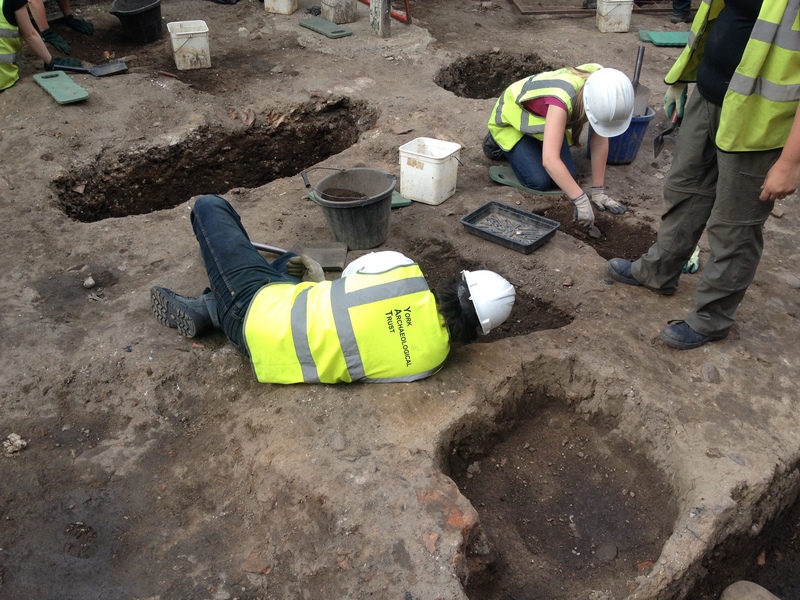 Alan and Rosie recorded the pit as it stands before moving on to some nearby deposits. Rosie and Alan investigating a new feature. 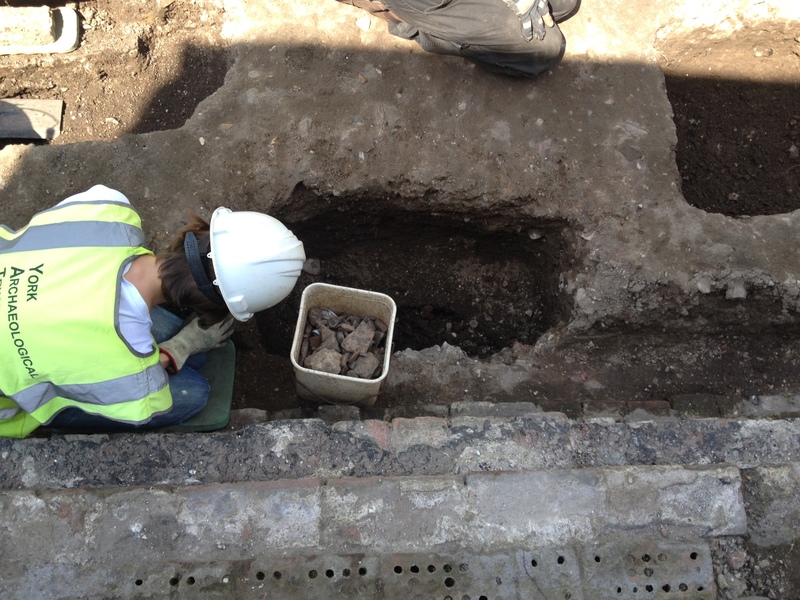 The pair recorded and excavated a feature that cuts through a cobble surface discovered back in week 5. As work on this context progressed, it became increasingly likely to represent an infant burial. Again, we plan to complete work on this feature later in the season. A continuing theme of industrial use is appearing in the northern end of the trench, with burials proving more sparse, and surfaces, pits and post holes more abundant. Clearly, the yards of the 18th and 19th century were used in different ways at different ends. 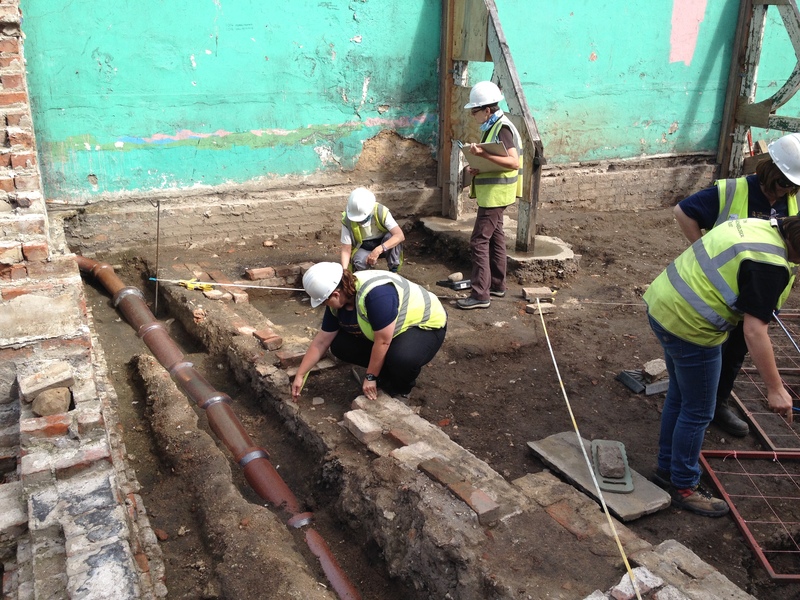 Jemima, Julie, Elizabeth and Carmen joined Gary’s team on one and two day taster courses and helped to excavate a number of deposits. 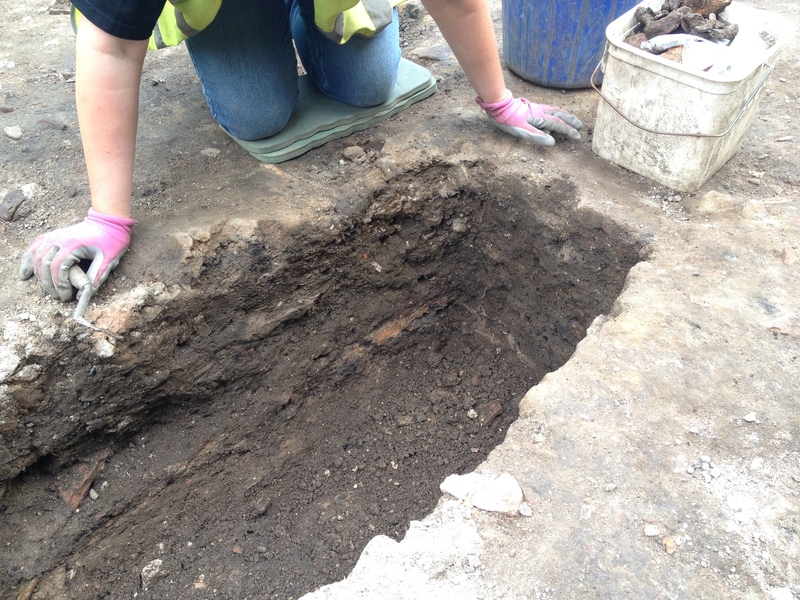 Close to Biagio and Ellen’s deep grave cut, a dump deposit was lifted that revealed some interesting features. These included dumps of mortar and an edge-set tile footing, some goodies to play with in the coming weeks! 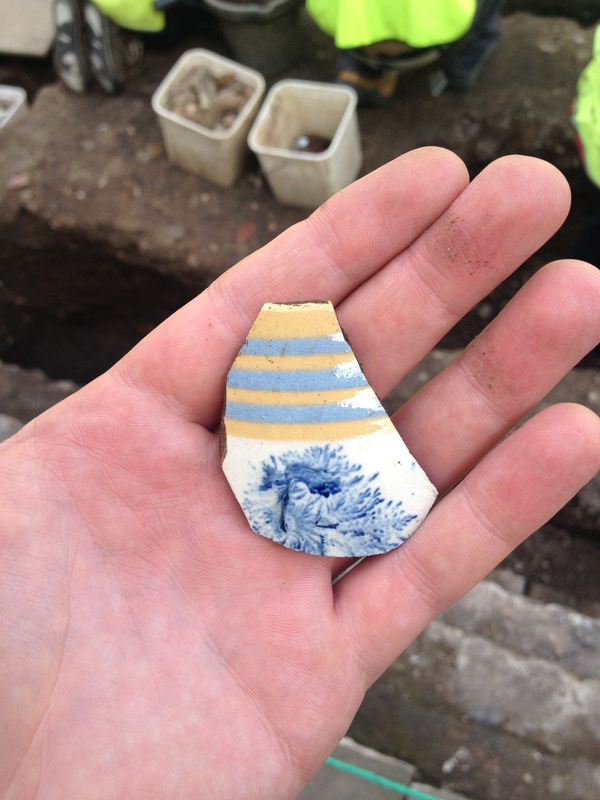 Finds highlights included some more great medieval pottery, one sherd complete with the potter’s fingerprints on the interior! 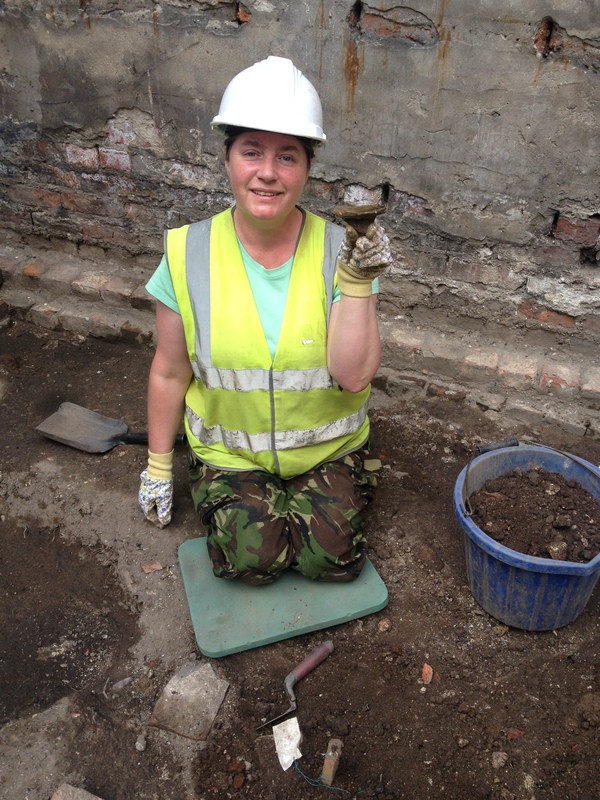 Carmen with a sherd of medieval pottery. Quirks like these are a wonderfully personal way to get in touch with the people who lived through the times we study. The fingerprints of a medieval potter. 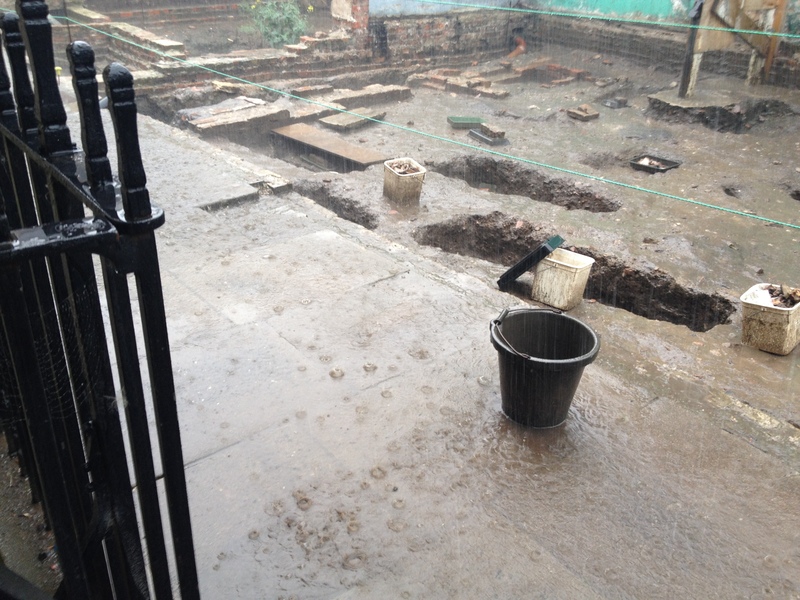 Heavy rain on Friday saw the team focusing on indoor activities, but this didn’t hamper a week of real discovery! New deposits and structures are appearing in abundance, the next few weeks are going to be very exciting! 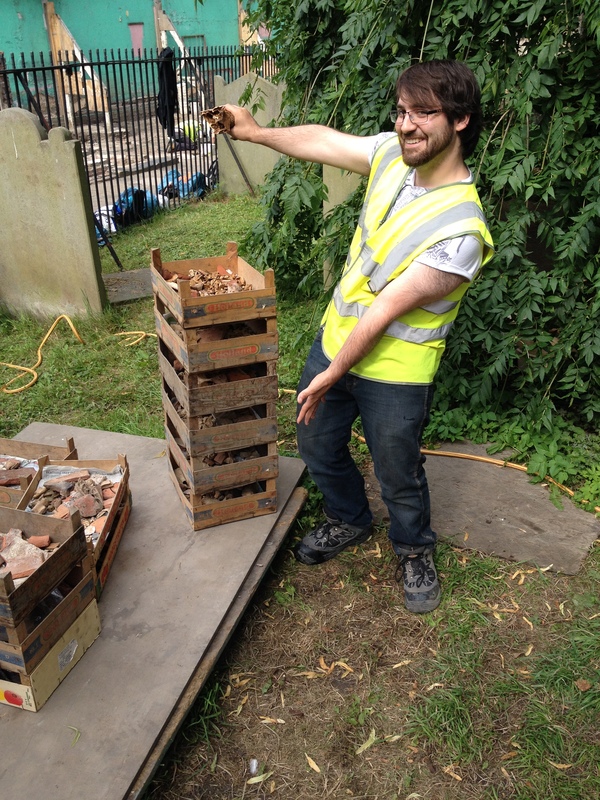 Under the Tree of Finds, Arran and the finds crew had a very busy week! The remaining contexts that were already washed and dry were sorted into categories and bagged separately in advance of being looked at by relevant specialists. 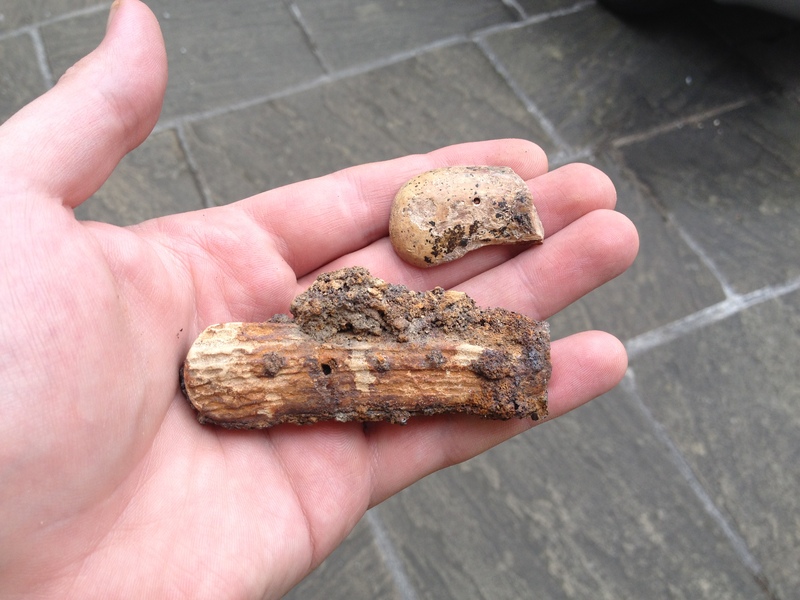 Some nice small finds were noticed including these lovely 18th/19th century knife handles. A bone (upper) and antler (lower) knife handle. Trample deposit 1116 from Toby’s area proved to be a real monster! 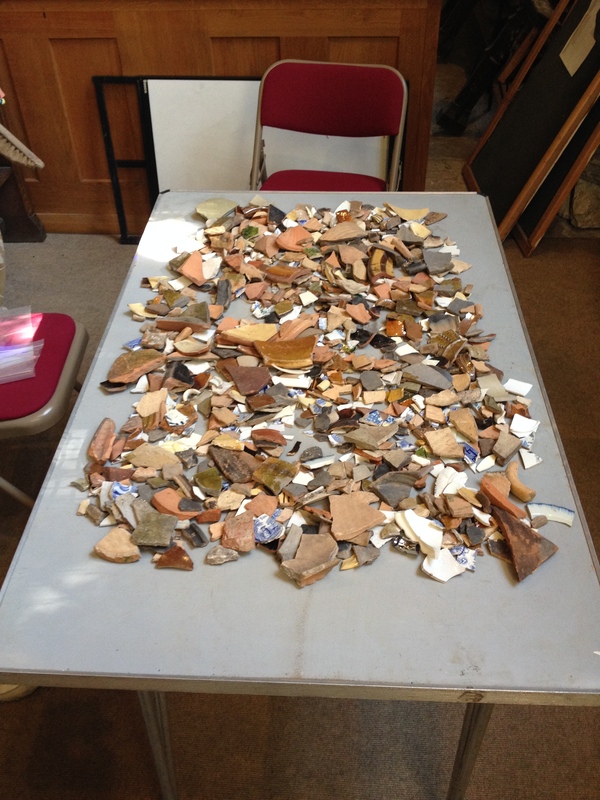 Hundreds of sherds of pottery and fragments of animal bone were sorted and bagged up. The pottery varied from 19th century to Roman, with great examples of Viking and medieval wares. The pottery from context 1116. Fingerprints would prove to be an enduring theme this week. Not always visible when covered in dirt, fingerprints were noted in several artefacts as they were cleaned. 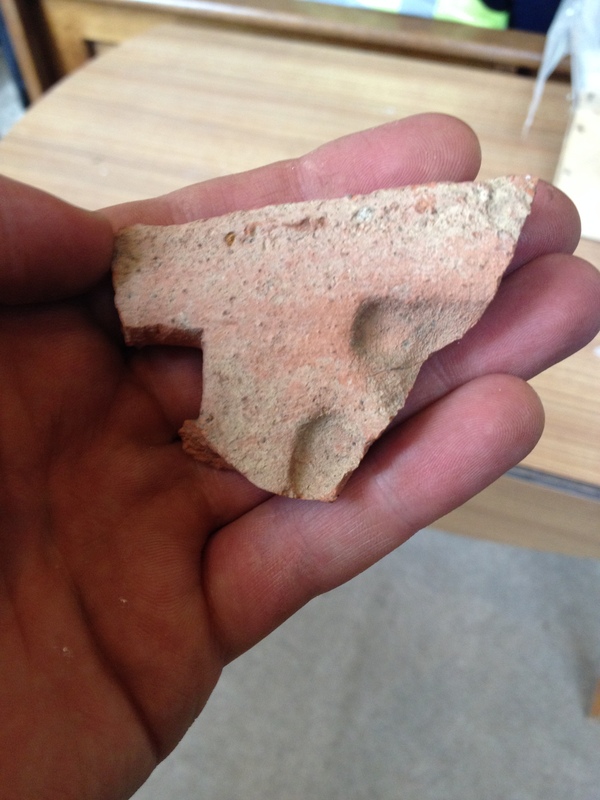 One medieval tile sherd featured the fingerprints of a child! 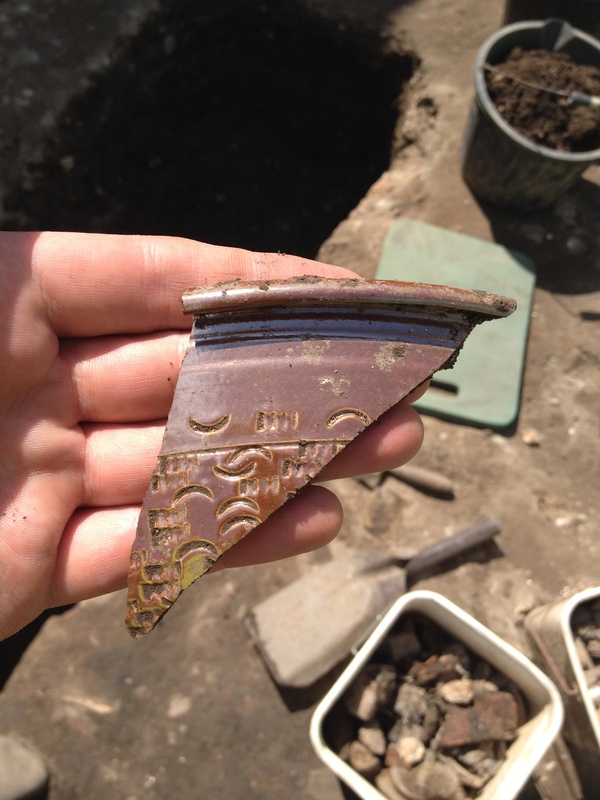 Viking and medieval pot sherds were also recovered with ‘pie crust’ decoration. Viking Torksey ware, complete with thumbprints. 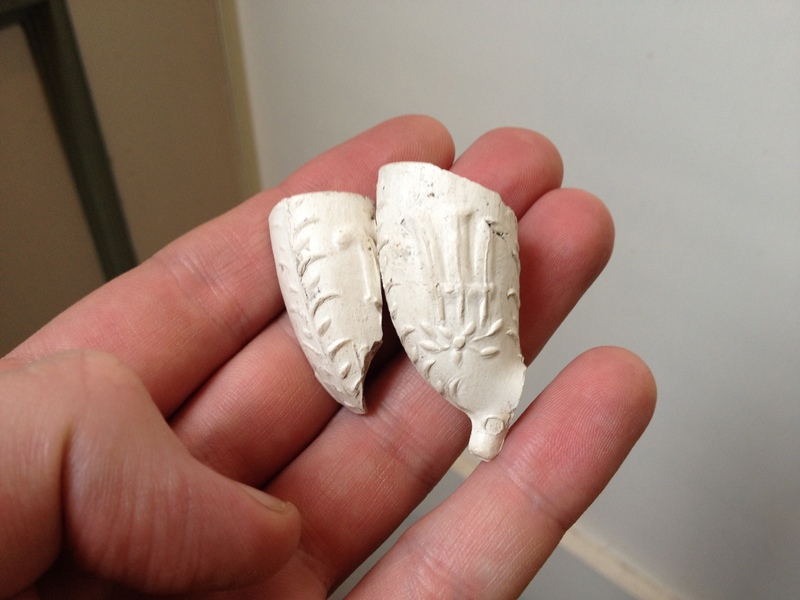 A bit of historic research revealed why we have been finding so many clay pipe bowls decorated with a fleur de lys motif; it turns out that a Prince of Wales pub was in business on nearby Skeldergate in the 19th century. 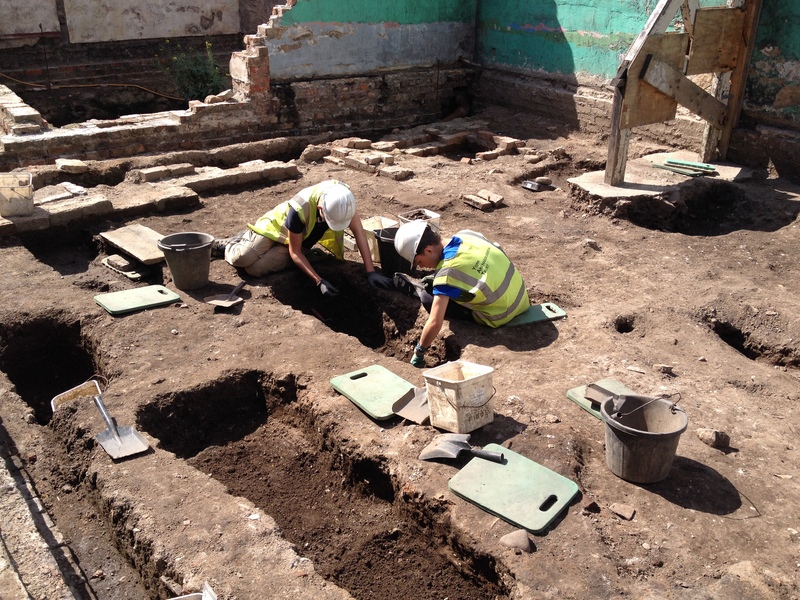 Clearly the people working in the yards we have been excavating were partial to a lunchtime ‘pint and pipe’ deal. Fleur de lys decorated pipe bowls from the Prince of Wales pub. 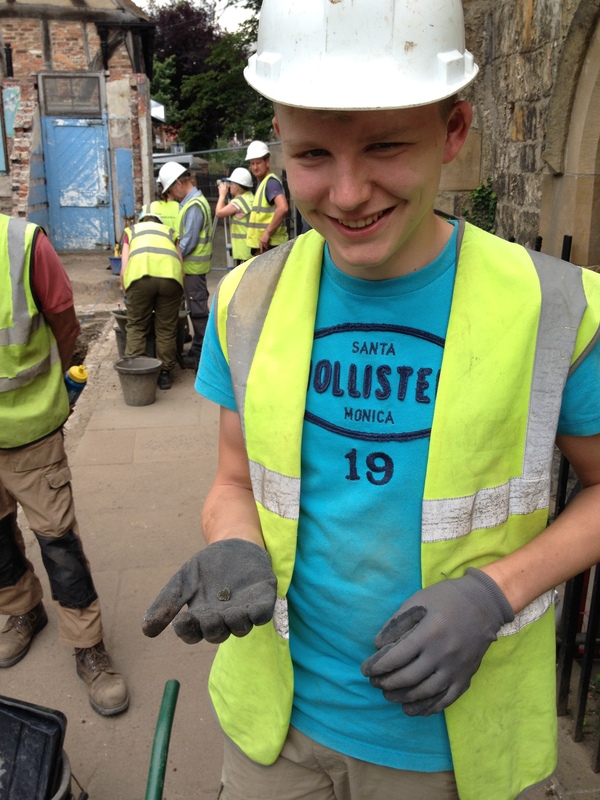 The last of the finds from Biagio’s bone pit from week 6 were washed this week. Once they are dry, we’ll have a closer look at them and see if any surprises lie hidden. Biagio and his mountain of finds. It could easily have become frustrating to start work on so many features and have to step away, but our trainees understand the value of dealing with human remains in a proper manner. Delaying the work until they can be easily reached will allow for more delicate treatment of the burials and a safer working environment. 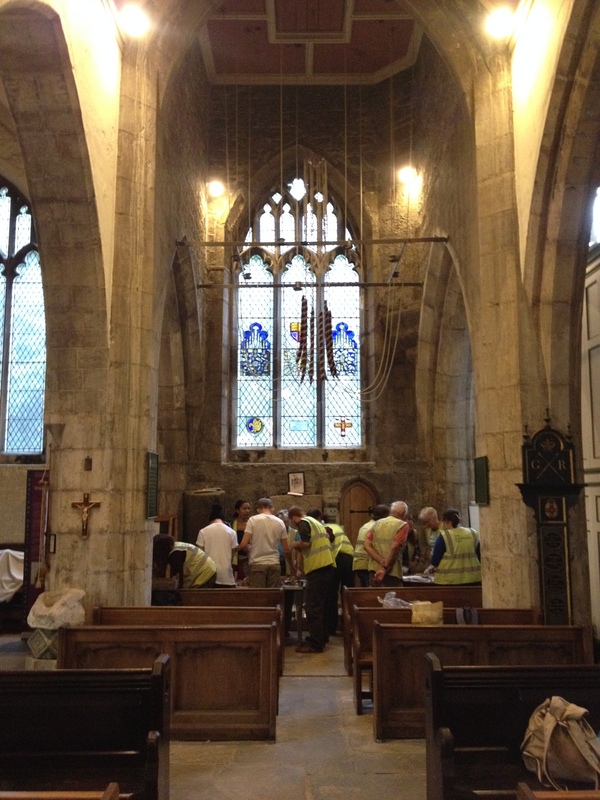 This way, we will be able to learn a little about the former parishioners of All Saints, before re-covering them and leaving them in peace, safe from any future development. The variance of activity between This End and That End is becoming ever more pronounced, with That End proving to be busier and more industrious in nature. Perhaps the residents of the old rectory preferred a quiet life and kept the noisier, smellier activities at a distance. This relationship will be studied further next week. We now know the location of numerous burials and will continue to identify new ones, but we will also look to investigate even earlier activity from hereon in. 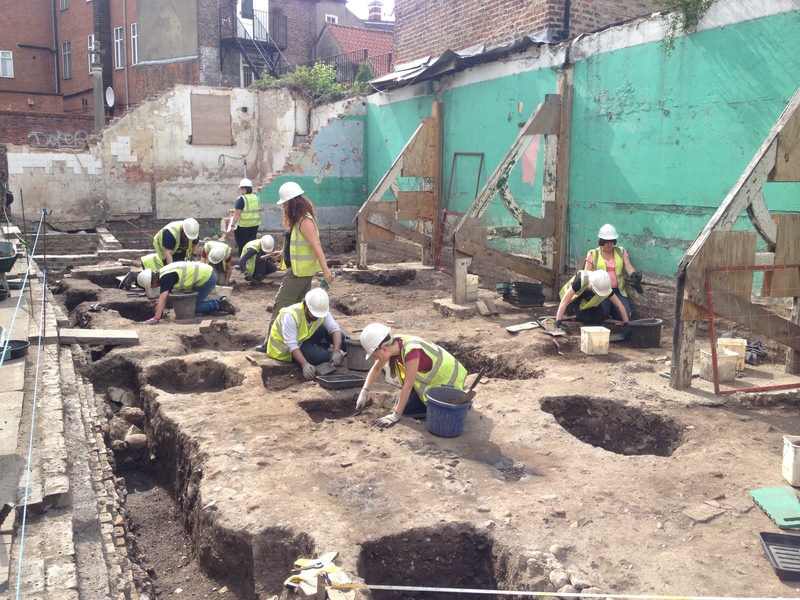 Week 7 has succeeded in bringing much of the site back to the late 1700s/early 1800s. 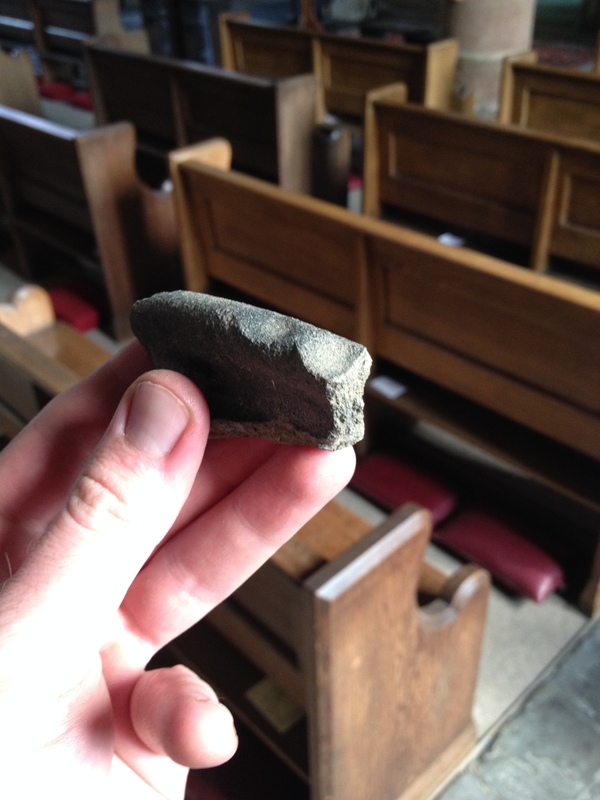 We have found even more structural evidence of the rectory and begun to reveal the site’s more industrial past. All of this is down to the hard work of our dedicated team of trainees and placements, who all deserve a good pat on the back. Great work guys! The only downside this week was seeing site mascot Planty the Plant succumb to the rain and topple over. Don’t worry though folks, he’s down but not out! 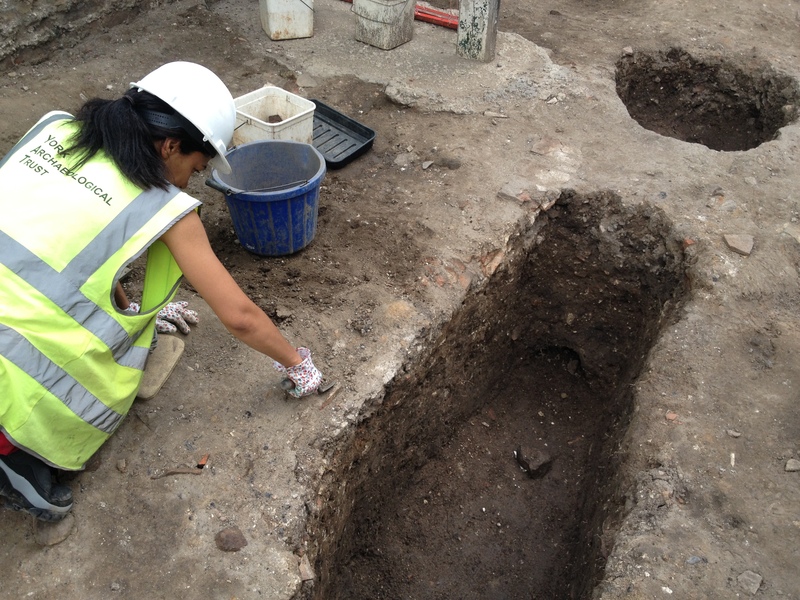 Next week, we’ll continue to spot new burials and investigate the activity that pre-dates them. The post-medieval horizon creeps ever closer, onwards and downwards! !